The Taylor House now known as Turnbridge Point. Former residence of the town dog killer. 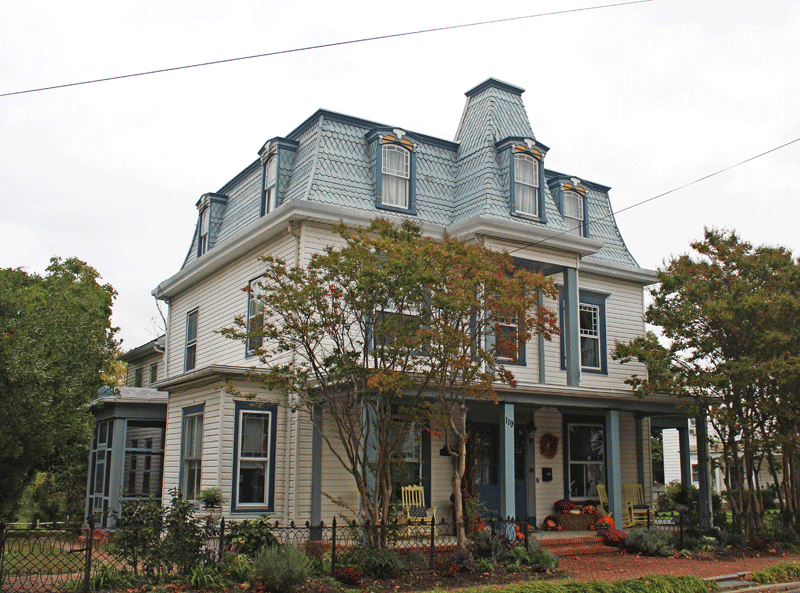 The most beautiful house on the Caroline County’s Courthouse Square in Denton sits on the corner of Gay and Second Streets. It’s a Second Empire Victorian style with its hipped roof, center cupola, iron fence and ornate trim sets it apart from every other house on the square. 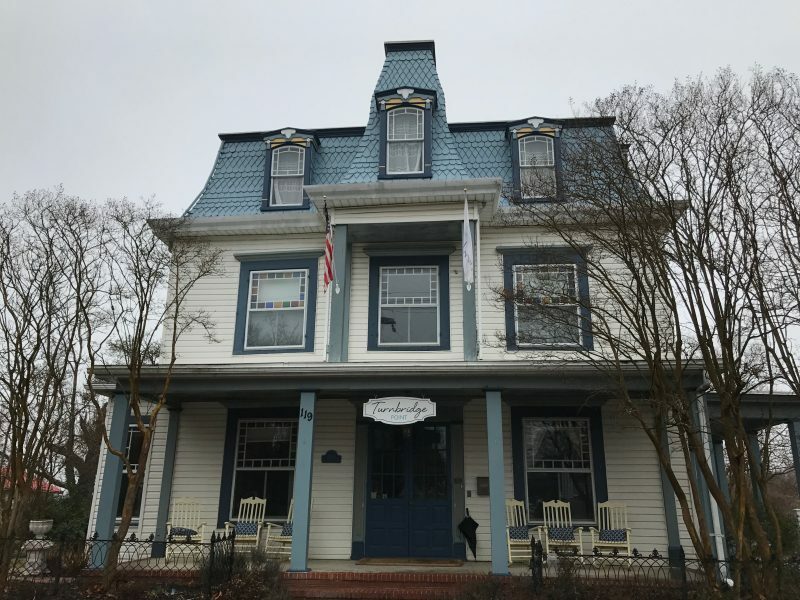 The ample corner lot runs straight down to the Choptank River, which is wide and placid at this northern end, some thirty plus miles from where it empties into the Chesapeake Bay. When a long time owner of the property moved out in 2000, a real estate agent showed the property to a potential buyer who lived out of state. The owner wasn’t present during the viewing, and the potential buyers took several photographs of the house. About a month after they had looked at the house, they returned to Denton hoping to find the owner. When they knocked on the door, there was no answer, so they visited the Town Hall hoping to get help with locating the owner. These potential buyers had decided not to buy the house. But when they reviewed the photographs they had taken, they noticed a strange anomaly in one of them. It was disturbing. It was a view of the house from the outside that showed the front with all of its beautiful features and ornate trim. But it also showed the image of a child looking out of the third-floor window. The owner wasn’t present when the couple viewed the house, and they’d been told that no children lived there. The couple had also gone through that third floor, and they saw no sign of a child – no toys, no clothes, nothing to indicate that a child even lived in the house. So naturally, the image of a child in that window caught them by surprise. The couple also observed that in their photograph, the child appeared to be a little girl dressed in old-time white clothing, wearing a large bonnet. They felt compelled to tell the owner. They wondered if a child spirit was trying to send a message. They drove to Denton with the picture in hand with the intent of showing it to the owner and seeing if the owner knew about the child or had experienced any kind of unexplained events. They wondered if a child might have died in the house. When the couple arrived in Denton, they knocked on the front door, but there was no answer. So they went to the Town Hall to see if anyone there knew about the history of the house or could offer insight about the child in the window. The Denton Town Manager met with them and she saw the picture but neither she nor her staff could help with linking the history of the house to the child. People in Denton knew it as the “Taylor” house – named for a previous owner, but there was no memory of a small child living there. So for that couple, the visit to Denton was a dead end. As far as anyone knows, they never connected with the owner or returned to Denton. The child in the window remained a mystery. This house does have a sad history. Denton residents in their eighties and nineties can recall the house being owned by a retired farmer named Will Taylor. He was commonly referred to as “Old man Taylor” and was suspected of poisoning the neighborhood dogs. Mrs. Marianne Walsh recalled that when she was a little girl, her mother and her mother’s friends often talked about one Sunday morning when Denton families woke up to find their dogs dead in their yards, in the roadways and even a few dead on the courthouse green. They’d been poisoned and everyone suspected “Old man Taylor” because he was always threatening to something about dogs that got into his yard or walked too close to his fence. According to his neighbors, he liked the boundary his fence offered between him and the rest of the world. The whole property had a kind of bad karma or negative energy when the Taylors owned it. 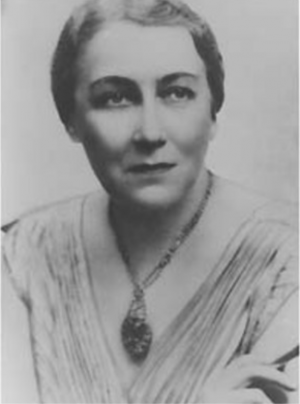 Sophie Kerr was a Denton native, and she became a successful magazine editor and novelist in the early 1900s. Though she left Denton and moved to New York to work as a journalist gaining notoriety writing for publications such as the Saturday Evening Post and McCalls Magazine, she never forgot her childhood home, and she returned often. She was born and grew up in a Denton farmhouse about time that the Taylor House was first built. Both her house and the Taylor House still stand a mere mile apart. Sophie would have known the Taylors and would have been in the thick of all the banter and drama that went on between neighbors. She set many of her short stories and novels in landscapes and communities that had a startling similarity to Caroline County – and Denton in particular. Charlie went round the Square to pass the Emerson house, a high-shouldered building with a cupola, set back in a good-sized yard enclosed by an iron fence. The story depicts the grumpy old farmer who is not able to get along with his neighbors. And he hates dogs. He gets suspected of poisoning the town’s dogs toward the end of the story. It’s quite a parallel to the real-life Taylor story in Denton. Both houses are set on a Courthouse Square. Both have a shouldered roof, cupola, and iron fence. Both houses are owned by an anti-social retired farmer who has a propensity for dog poisoning. But if these similarities weren’t enough to indicate Sophie Kerr was retelling the Taylor story in Denton, the farmer in Sophie’s story is named is Louis Rolyat. Rolyat is Taylor spelled backward. In her story, Sophie Kerr depicts the Taylor House (or Emerson House as she named it) as a dark place, with no love and no light. Mr. Rolyat forces his wife to keep the shutters closed so no one can spy on them. It’s a house that causes people wonder what really goes on inside. He berates his wife and daughter, and they fear him. The neighbors try to be friendly, to reach out, to include the family in community gatherings, and they are repaid by having their dogs poisoned. The story does have a happy ending in that Mr. Rolyat gets hauled off to court and presumably jail for poisoning the dogs, and his wife and daughter are set free from the from their oppressor with a kinder future ahead. Sophie Kerr knew the people in Denton at that time, and it’s likely that she knew or at least had seen Will Taylor during her return trips home. Historians and Eastern Shore literary scholars say that Sophie Kerr based many of her stories on Caroline County and people that she knew. Her interpretation of Mr. Rolyat matches Mrs. Walsh’s, but Will Taylor died in 1930, so most everyone who knew him has passed on by now and can’t weigh in on the comparison. When we consider that the Taylor House might be haunted by the spirit of a child, Sophie Kerr’s story is no help in trying to figure out who the child might be. The Rolyats have just one daughter, and she gets engaged at the end of the story. What we do know is that William Taylor was a wealthy farmer, who was born in Delaware. He married Mollie Hignutt, a girl from Caroline County, and they settled on a farm in Hillsboro. They had three children. Their eldest was a son, W. Price Taylor who was born around 1882 – a year after they were married. They had a daughter, Miriam five years later in 1887, and their youngest child Katherine was born in 1895. Somewhere between 1900 and 1910 the family moved into the Denton house. Price Taylor died in 1906 at age twenty-four, and if he lived in the Denton house it was as an adult – and for only a few years. Miriam got married but then divorced and returned back to the Denton House where she lived with her sister Katherine who didn’t marry until she was fifty. The two sisters lived in the Taylor House as single women up until 1945 when they sold the house shortly after their mother died. Neither daughter had any children. Or did they? I interviewed the late Mr. Charlie Moore whose family has had the funeral home in Denton for over one hundred years. Mr. Moore, now in his nineties, remembered Will Taylor well, and remembered that he wasn’t friendly. Mr. Moore also mentioned that Taylor had two daughters. Neither was married, but one of the daughters had a baby, a little girl. According to Mr. Moore, the child died when she was very little – before she was old enough to go to school. The Moores handled the funeral arrangements. Mr. Moore said the child’s mother was never happy after the death and remained reclusive. Whether the mysterious image in the window is the spirit of a Taylor child, we can’t say. But we can surmise that there was a lot of pain in that family; a harsh, unyielding patriarch, the death of an only son, two lonely daughters who never find the joy of raising families of their own. Maybe that sadness has lingered, and perhaps that heavy aura in the house has driven people away, and that’s why no one has stayed very long. But there is good news. The house is bright once again and full of hope and celebration. The couple who bought the house has turned it into “Turnbridge Point” Bed and Breakfast. One of the owners is Pastry Chef Steve Konopelski and his creations are part of the awesome breakfasts served. They do admit that there’s occasional unexplained activity in one of the upstairs bedrooms. So if you’ve always wanted to stay in a “haunted” inn with great food and hosts with character, check them out. They’re one block up from the most haunted building on the Eastern Shore.